I haven’t yet put Firefox through the paces for usability, which of course, is an equally important aspect of any software. But for the time being, I’m going to give Firefox a chance. I’ve just set it as the primary browser for my Galaxy Tab to give it a fair shake. I might have done so sooner if I used Firefox on the desktop; the mobile browser can automatically sync bookmarks, history, saved passwords and open tabs with its desktop counterpart. Update: Although the native Android Browser takes some user interface cues from the open source Chromium browser project — which Google’s Chrome browser is based upon — I’ve updated the post for clarity, changing “Chrome” to “Android Browser.” The name change obviously doesn’t affect the tests, but is a more accurate reflection of the browsers used. I’m seeing image degradation when using Firefox (very pixely). Some of my favorite webcomics like Least I Could Do look pretty bad.My guess is that this is being done to optimize speed. Haven’t seen any way to turn it off. Have you run into issues with this? Saving as PDF functionality is pretty awesome. Combine with Repligo PDF reader and it’s a great way to annotate a website for later. How does the Opera browser compare ? 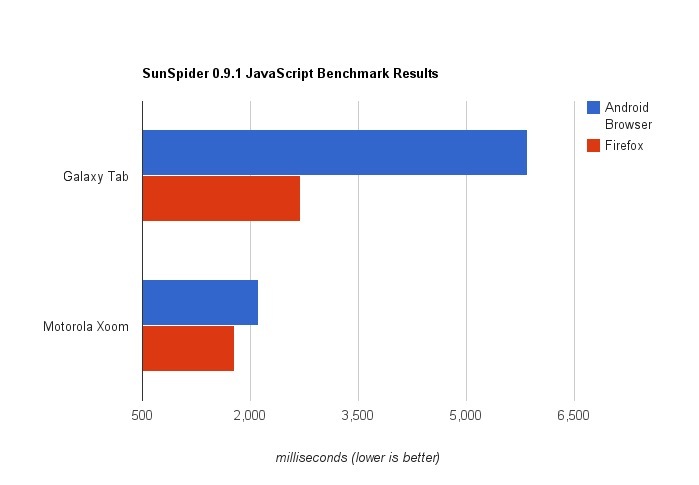 Go firefox go…get more & more faster…. Android’s native browser is not based on Chromium. It is therefore incorrectly named in this article. henchan, thanks for raising this point. I’ve updated the post to clarify the browser name. Going to have to give it a try too!